Wow, thanks for all the great Content Strategy input from comments and email. Based on your suggestions I made a few updates and corrections. And there are other smaller changes here and there. 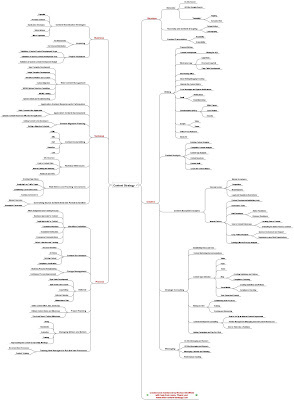 Here is an easier-to-manage PDF version of the Content Strategy Mind Map that you can download. 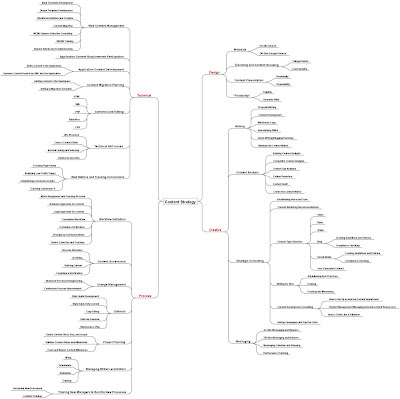 I was looking at Jeffrey MacIntyre's Knol on Content Strategy and really liked the back-of-the-napkin mind map he did about the different components of Content Strategy. That seemed like an interesting project so I decided to take a few minutes and take a stab at how I think about the various parts of Content Strategy. So I built my map around those nodes. Of course, I already see many things that I could change so I'll probably be messing with this forever, but it's a start. I'm hoping that you guys have some ideas too. I'm sure there is a ton of stuff I've missed. While out in Austin for the South by Southwest Interactive festival, I had a chance to talk to a lot of agency people. A lot. One of the questions I always asked was "Do you have people on staff with the title Content Strategist?" Almost all of them did and content strategy was part of their standard offering to clients. Certainly all of the really big agencies I talked to had content strategists on staff and also frequently brought them in on contract along with extra information architects. I had to finally face the fact that I made a bad content strategy decision when I built this blog on the Blogger blogspot domain instead of one of my own. A redirect is in place so old bookmarks and links will continue to work just fine. Finding a good URL is not easy these days so here's a little trick I figured out. 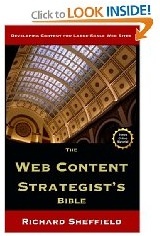 By adding the word "weblog" to my main SEO keyword phrase "content strategy" I was able to sneak the words "web" and "blog" into my URL. I give myself a break around New Years by avoiding all the planning and goal setting that usually arrives with a new year. It’s cold and dark, I’m generally suffering from post-holiday grumpiness, and I’m facing going back to work with no official holiday until Memorial Day in May. Not a good time for optimistic and ambitious planning. So I wait for Spring. For some reason Spring has a profound affect on me and my mood rapidly improves even though I’m covered with a quarter inch of pollen. The first order of business this year was to revisit, and add to, my Things to Do Before I Die list. One of the things I added this year was to fund a Kiva.org project. Kiva is just an amazing program that facilitates person-to-person lending. It connects the richest people in the world (you and me) to the poorest. For a few hundred dollars, Kiva will let you fund a project for a family or small business that will have a profound affect on their lives. Something as simple as funding the purchase of a new cow, or the parts to fix an old motorcycle can take a family from just getting by to having a little extra. Plus, they have a payback rate of over 99%, much better than most U.S. banks these days. Once I added that goal to my list it became obvious to me that there was no reason to wait on this one, I could accomplish it right now. So I’m taking everything I make on The Web Content Strategist’s Bible this month and using it to fund as many Kiva projects as I can. Thanks up front to everyone who buys the book (print or ebook versions) this month, I’ll let you know what projects I fund and include updates as I hear from the recipients.